Panic selling of oil continued in December, further benefitting net users of oil at the expense of net producers. From a valuation perspective, spot oil prices have gone from 100% overvalued at the end of August to almost fair value at year-end. Market focus on the impact on producers has led to greater concern about global economic weakness. This has had a number of effects. The outlook for oil demand has weakened and is combining with a current supply glut to further pressure oil prices lower. Equity markets and credit spreads are also coming under pressure – with investors preferring the safety of government debt in the US and other major economies. As we begin 2015, concern about the European economic weakness and currency sustainability has resurfaced – even as ECB plans additional quantitative easing. Government bond yields stand at record lows in all major global markets. Credit spreads have widened to near their past 12 month highs, initially based on concerns about oil producers defaulting but now based on fears of broader economic weakness. Credit spreads are just below normal – mid cycle levels. 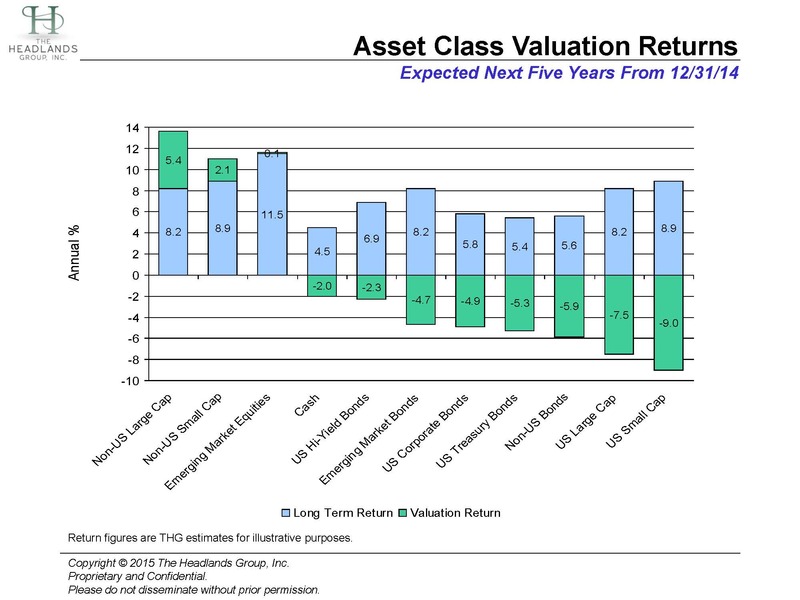 Best asset class valuation opportunities are in non-US large cap equities where weak economies and investor pessimism have depressed both equity prices and currencies. Non-US small cap equities are also very attractive, but to a lesser degree as they have held up better than large caps. Emerging market equities are next most attractive at near fair value. The cap-weighted average masks the wide range of attractiveness of individual markets. Collapsing oil prices and choking economic sanctions have devastated Russian equities and the Ruble. After Russia, Brazil, Peru, Chile and Mexico offer the best value while Thailand, Indonesia, China and Turkey offer the worst. Recent investor favorites US small and large cap stocks provide the least attractive valuation opportunities. Aggressive world central banks continue to support all risky asset globally, while reducing the attractiveness of government bonds. The current extraordinarily appetite for bond investments globally from central banks, banks and investors means that new bond investors today face significant future losses before they can earn normal returns. Low and high quality credits enjoy the same central bank support as equities. US high yield and investment grade credit spreads are near normal while emerging market spreads remain below normal. Local currency emerging bond investors have been learning from markets about currency risk. Developed market non-US government bonds offer better near term cyclical value and potential currency rebounds.